At the Equifax hearings, a Mr. Monopoly photobomb is drawing attention to predatory arbitration clauses. Former Equifax CEO Richard Smith, and over his right shoulder, an activist dressed as Mr. Monopoly. Once upon a time, Mr. Smith went to Washington, and now, so has Mr. Monopoly. This week, Congress is holding hearings about the Equifax breach and treating its former CEO Richard Smith as a “rhetorical punching bag,” as Slate has noted elsewhere. But Congress’ pursuit of truth can’t hold a candle to the real hero of the people: Mr. Monopoly, who is peering on from the audience. 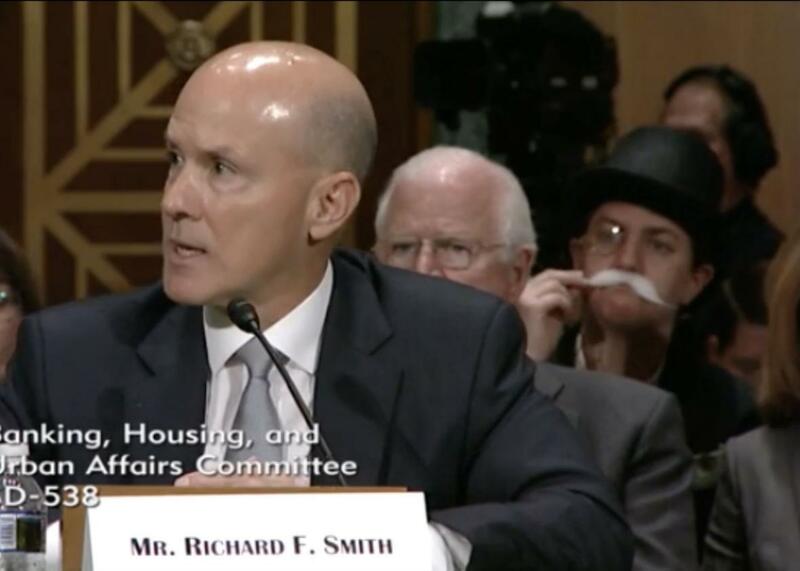 As the hearing livestreams online and airs on television, the person in costume can occasionally be seen over Smith’s shoulder wearing a top hat and fake, long white mustache, parodying the way companies like Equifax profit off of their treatment of consumers. Sometimes the behatted observer twirls her mustache on camera—that is if she’s not busy adjusting a monocle or pantomiming with fake money. Because the internet can’t resist a good photobomb, the stunt is gaining attention all over social media. The Hill identified her as Amanda Werner of the advocacy group Public Citizen. The character is technically known as Rich Uncle Pennybags, but aliases and costume changes are part of any hero’s playbook. Or, actually, as a Twitter user points out, Mr. Monopoly doesn’t wear a monocle, so perhaps this is more of a generic old, rich jerk? Either way, though, she’s an American hero. According to CNBC, the costumed crusader’s appearance comes courtesy of the groups Public Citizen and Americans for Financial Reform, which are seeking to draw attention to the way forced arbitration clauses favor financial institutions rather than consumers. In a statement, Public Citizen called arbitration clauses a “get out of jail free” card for companies: “Forced arbitration clauses buried in the fine print of take-it-or-leave-it contracts may be the single most important tool that predatory banks, payday lenders, credit card companies and other financial institutions have used to escape accountability for cheating and defrauding consumers.” When Equifax announced the breach, which compromised more than 145 million people’s personal data, it initially required that consumers agree to arbitration if they wanted to use the credit monitoring service the company was offering to those affected, a condition the company has since nixed and Smith has called a mistake. With its Monopoly stunt, Public Citizen hopes to draw attention to and prevent the Senate’s efforts to strike down a Consumer Financial Protection Bureau rule that allows consumers to challenge wrongdoing in court class actions. The message to both Equifax and Congress is clear: Do not pass go. Do not collect $200.